Translate financial data and streamline international transactions. Developer website: Mohan Embar, Inc.
Is there a better alternative to Num-Num? Is Num-Num really the best app in Language category? Will Num-Num work good on macOS 10.13.4? Num-Num helps you write checks in foreign languages. How do you spell "38"? How do you spell out "$63.38" on the check you're writing? If you're living abroad or learning a foreign language, the answer might not be obvious. 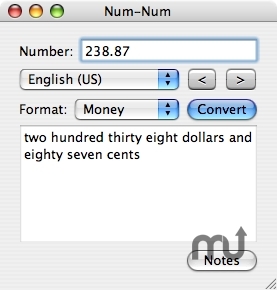 Num-Num is a free program that helps you with counting and writing checks. You can spell numbers in a variety of formats (cardinal, money, year or ordinal) and can also step sequentially through a series of numbers (one, two, three...). Num-Num ships with rules for English, French, German, Spanish, Italian and Dutch! Num-Num needs a rating. Be the first to rate this app and get the discussion started!